When faced with a threat that is oh so tiny, we cannot help but exert our God-given largeness. Now imagine it the other way around and give account of what happens when we are what’s tiny. When our perspective shifts so quickly, cognizance and spatial orientation and size matters altogether, all at once. With the literal, figurative, and fantastical world of ants (and the occasional other insect) at her disposal, Sawako Nakayasu plays with perspective throughout The Ants, shrinking her lens at any moment to narrate (via ant) the ants’ struggle to hitchhike on passing shoes or widening her lens to narrate (via human) an adult’s lifetime desire to own an ant farm. As the perspective shape-shifts from piece to piece, the playfulness lends Nakayasu the ability not only to shake up stylistic elements of form and tone but to harness imagination further. The Ants is a world where “the clever ants who can read numbers” perch on light bulbs with the lowest wattage to avoid death when humans turn on the lights. It is a world where the ant farm a child always wanted is now circulating in her adult body, leaving her to explain: “And so it is that I am forced to call up my friend who owns a gun to come over and shoot me, somewhere harmless like my leg, where it won’t kill me, just make a big gushing wound large enough so the ants can get out, and he does, and they do, and now do I miss them.” It is a world where two ants set out from opposite ends of the Great Wall of China and upon their rendezvous cause two bickering women to stop fighting in awe of the ants’ “force and intention.” In this way, the ants in The Ants are not always ants or even solely stand-ins for humans. 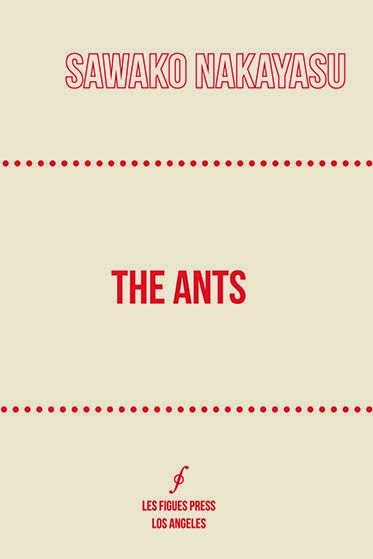 Similar to how Richard Brautigan’s Trout Fishing in Americamorphs into more than a book title, the air in The Ants is swollen with high “ant density levels,” ants are manuscripts (“he edited my ant, without even asking”), ants are blankets that you wear to keep warm. In this way the fancy of the ants becomes even more fantastical, and we as readers are continuously surprised at the lovely turns such extended metaphors take. I leave the house for a couple of months, and upon my return find that a gang of ants and a gang of cockroaches have been having turf wars in my home. I don’t actually see any ants or cockroaches, but I can tell by those tiny colorful bandanas they have left behind.